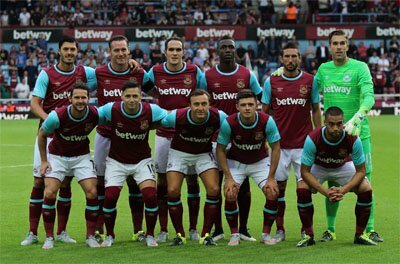 With their attractive style of play, claret and blue jerseys and a catchy anthem, West Ham United are certainly a unique beast in the football world. They have a reputation of cup specialists – in addition to winning a Cup Winners' Cup in 1965, they have also claimed three FA Cup trophies. Since the early 50s, the club has been known as "The Academy of Football", with many young and talented players coming through their ranks. West Ham team in Villa in 2015. Even though the club was reformed as West Ham United FC at the turn of the twentieth century, their roots go back to 1885 and the foundation of Thames Ironworks FC. The club was founded by Arnold Hills, the director of the Thames Ironworks shipyard department; the idea was that a football team would improve the relations between the management and the workers. Their humble beginnings as a works team are a big part of West Ham's history, which is most evident in the club's most popular nicknames (the Hammers and the Irons), as well as in the club's crest, which still features a pair of crossed rivet hammers. In the early years the club played in London League, Southern League and Western League. In 1919 West Ham became a member of the Football League. Four years later, in 1923, they would partake in a legendary game. It was the first FA Cup final that took place on Wembley Stadium and the estimated attendance was far over 200,000. In the game, they would fall short to Bolton Wanderers. Up until the 50s, West Ham were a fairly unremarkable club, albeit with a passionate fan base. It wasn't until Ted Fenton took over as manager that things finally started taking a turn for the better; during his eleven years with the club, Fenton made the club's youth school an integral part of the club's identity. This change in philosophy led to West Ham forming a talented team led by Bobby Moore, who would soon become one of the greatest football stars of his era. The 60s saw the club reap the rewards of their reliance on the youth school. In 1964, West Ham claimed their first major honor by defeating Preston North End in the FA Cup final. The following year, the club would go all the way in the Cup Winners' Cup, outlasting 1860 Munich in the finals with two goals from Alan Seeley. West Ham won two more FA Cups in 1975 and 1980 before eventually slowing down and retreating from the spotlight. While the club had stuck to their brand of attacking football, they would not win another trophy for the next couple of decades. They remain one of the most consistent sides of English football, however, having never been relegated to the Third Division. In 2016, West Ham moved to the new Olympic Stadium after palying at Boleyn Ground for over hundred years. The new Olympic Stadium would swallow 60,000, almost twice the capacity of Boleyn Ground. The logo features a pair of crossed rivet hammers which is part of the club's heritage as a workers team. After a fans vote, the castle in the crest was removed and the letters of the team below the crest was changing position for the 2016-2017 season.